I use gelatin to stabilize the cake but it’s optional. If you don’t use gelatin, omit the 1/4 cup of water as well, without changing anything else in the recipe. Let the cake chill in the fridge for several hours or overnight before serving so it’s completely set. Cut and serve while it’s cold. It becomes soft at room temperature. You can make the cheesecake 1-2 days ahead. Make the crust: Pulse Oreos (the whole cookie, with the filling) in a food processor until finely ground. In a medium bowl, mix crumbs and melted butter until fully combined and crumbs are moistened. Press the mixture onto the bottom of a 9-inch or 8-inch springform pan using your fingers or the bottom of a cup to form a crust layer. Make the filling: For the gelatin mixture, combine gelatin and water in a small bowl. Let stand for 10 minutes to soften. After 10 minutes, microwave gelatin for a few seconds, just until melted and syrupy (avoid heating it any more as that will ruin it). Using an electric mixer fitted with the whisk or paddle attachment, combine cream cheese, powdered sugar and cocoa powder until smooth, then beat in Nutella. Add gelatin and whisk mixture until combined. Set aside. Using an electric mixer fitted with the whisk attachment, whisk heavy cream until soft peaks form (they should hold their shape but have a soft texture). Using a spatula, gently fold half of the whipped cream into the cream cheese mixture, then fold in the other half. Pour filling into the pan and smooth the top. Cover pan with plastic wrap and place in the fridge for 2 hours before glazing with ganache. Make the ganache: Place Nutella and heavy cream in a medium bowl. Heat in the microwave until melted. Whisk until smooth. Let cool slightly before pouring over cheesecake. Cool cake completely before serving, at least 4 hours. 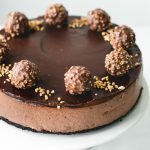 Decorate cake with Ferrero Rocher or chopped hazelnuts , if desired. Serve cold. Cheesecake will keep in the fridge for 5 days. It can also be frozen, wrapped tight, for 2 month. To thaw, place overnight in the fridge.